When the chief executive of one of Tajikistan’s few banking success stories stepped down in February, something seemed odd. Surprise turned to amazement when the head of another flourishing lender resigned a couple of days later. The recent shakeup at Eskhata Bank and Imon International, which are both privately owned, has little to do with finance, however. This is a story about politics and how the sprawling ruling family is deepening its control over a moribund economy, now increasingly at the expense of the country’s northern business elites. Imon International, a microcredit organization, is relatively unusual for Tajikistan in that it turns a profit. And it is extremely unusual in that it was founded and, until recently, run by a woman. The lender opened in 2005 and was an offshoot of the National Association of Businesswomen of Tajikistan, a support organization for aspiring female entrepreneurs. It was backed by multiple international financial institutions and has focused on helping small and medium businesses. Nine years ago, 45-year-old Nazokat Hafizoda, decided to open a beauty salon and turned to Imon International for a loan. She needed $10,000 to land the premises and purchase equipment. “My spouse and I drew up a business plan, the bank economist gave an assessment and we got the loan,” she said. The salon, which goes under the name Noz, provides work for four other women. Once Hafizoda paid off her debts, she looked to expand further and took out another loan from Imon International, which agreed this time to offer a lower interest rate. “Imon is a stable bank, that’s why I always turn to them. On the whole, they always help out women entrepreneurs,” she said. Many recipients of credit from Imon International in rural areas of the north, where the lender’s business is predominantly focused, confirm this scenario. Disbursements are often literally seed funds – money to buy the raw materials with which to sow fields. Other times, the cash is needed to buy some basic but essential equipment. From 2015 through 2017, as the rest of the banking sector was falling to pieces, Imon International accumulated client deposits totaling 661 million somoni ($70 million). The figures may not be huge, but to be in the black is an achievement in itself. Tajikistan’s finance sector is a wasteland of banks crippled by often-senseless lending policies. The government has had to step in with barely affordable rescue packages to save the most important victims of maladministration. Despite Imon International’s outlier status, general director and founder Gulbahor Mahkamova suddenly announced on February 8 that she was stepping down to pursue further studies. Since leaving the bank, Mahkamova, who declined to speak to Eurasianet for this article, has moved to the United States. Her replacement in this fundamentally woman-focused lender is Zakir Abdrashitov, who previously occupied a lower function in the company. The tone of Mahkamova’s resignation statement at Imon was similar to a press release issued two days earlier by Eskhata Bank, which declared that in the interests of “improving the effectiveness of its operations,” it was letting go of its general director, Khurshed Nosirov. Eskhata Bank is synonymous with northern Tajikistan. Its branches are a ubiquitous sight in Khujand, the capital of the Sughd region. ATMs are regularly stocked with cash – a far-from-certain guarantee at other banks in the country. According to National Bank figures, the volume of deposits at Eskhata on January 1 stood at almost 930 million somoni ($105 million). That was a spike of 22.5 percent year-on-year – an especially notable point given the plunging trust in banks that has accompanied the financial crisis of the past few years. There are widely circulating rumors that Mahkamova and Nazarov were summoned to the National Bank headquarters sometime in January and strongly advised to tender their resignations, but none of the stakeholders have been prepared to go on record to confirm that account. “The general directors at Imon and Eskhata were forced out of their positions so that their banks would become less competitive. Compared with other problem banks, Imon and Eskhata seemed very trustworthy. This was a blow at their reputation. The trust people used to have in them will no longer be the same,” a banking sector expert told Eurasianet on condition of anonymity. Public commentary in any remote way involving the ruling family can incite severe reprisals. Tajikistan’s dozen or so banking institutions fall broadly into three camps. The near-dead, whose continued existence has been assured only by bailouts and whose activities revolve largely around struggling to pay out their disgruntled depositors. Then there are relatively flourishing institutions like Imon International and Eskhata Bank. And finally there are newer players who have appeared suddenly on the market with a flurry of slick advertising – namely Kommertsbank Tajikistan and International Bank of Tajikistan. The background of this group indicates they enjoy a considerable advantage in the form of political patronage. Kommertsbank Tajikistan’s website offers up some broad-stroke details about its history. Before rebranding in October, the bank went under the name Faroz and was a microcredit group. And one year before that, the lender was called Muzaffariyat. The original founder of the institution, Muzaffar Jumayev, told Eurasianet in a brief phone call that he set up the lender in 2006 and sold it on three years ago. As to who owns Kommertsbank Tajikistan now, nobody quite knew until reporters quizzed National Bank chairman Jamshed Nurmuhammadzoda on the matter in February. Nurmuhammadzoda revealed that it is owned by a company called Faroz. The revelation of that final piece of the puzzle was interesting but shocked nobody. Faroz has since 2012 belonged to President Emomali Rahmon’s son-in-law, Shamsullo Sohibov. Prior to that, the company was controlled by Umarali Kuvvatov, an entrepreneur who was forced to flee Tajikistan and later set up a foreign-based opposition movement after getting embroiled in a business dispute with Sohibov. “He squeezed me out of my business, and I was forced to flee Tajikistan urgently. The president’s family does not tolerate outsiders of any kind doing business in Tajikistan,” Kuvvatov told Moscow-based news agency Regnum in the summer of 2012, talking about his freshly created Group-24 opposition movement. Kuvvatov was shot dead in Istanbul in 2015. Subsequent investigations into the killing largely fizzled out. Sohibov, husband of President Rahmon’s third-eldest daughter, Ruhshona, has been uncannily fortunate in his dealings with rivals. Until recently, for example, his chain of Faroz gas-filling stations had two serious competitors – Russian-owned Gazpromneft Tajikistan and a company called Umed-88. But then in mid-October, Rahmon addressed a gathering of businessman to complain about Umed-88 owner Radjabali Odinayev, who the president accused of unscrupulously bilking bank loans. With Odinayev now facing prosecution, the fuel market has become suddenly roomier. And then there is International Bank of Tajikistan. This company appeared in 2016 with a flashy advertising blitz offering loans to college students, teachers and doctors. The bank dangled money to be used for the cost of studying, holidays, home repairs and medical treatment. 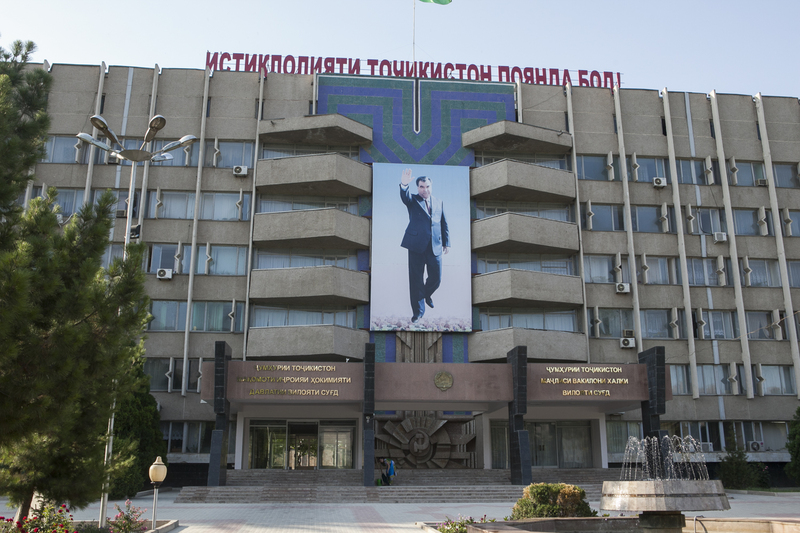 The promise of individualized repayment schedules was something new for Tajikistan. Untangling ownership here too requires some patience. The company websites show that International Bank of Tajikistan is also a reformed microcredit group, previously called Standart Finansy. Tax Committee data show that Standart Finansy was in turn owned by companies registered to Jamshed Gulov, who currently also serves as deputy chairman of Gazprom’s Tajikistan affiliate. Perhaps just as significantly, Gulov is the brother of Ashraf Gulov, who is married to Rahmon’s fifth-eldest daughter, Parvina.